Fight For Children, the Washington, D.C.-based nonprofit working to improve the lives of at-risk children throughout the area, is promising an exciting lineup at its Nov. 1 fundraiser. 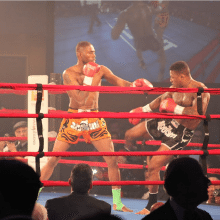 Dubbed Fight Night, the yearly event will convene nearly 2,000 leaders of business, government, philanthropy, sports and entertainment for an evening of fundraising, networking, boxing and musical performances. It all kicks off with a red carpet to highlight some of Fight Night’s celebrity supporters. Special appearances by “CREED II” star Florian Munteanu (“Viktor Drago”) and “CREED II” director, Steven Caple Jr. The movie hits theaters Nov. 21. A USBA Jr. Welterweight Championship fight between Sonny Fredrickson (19-1) and Manuel Mendez (16-2-3) as well as the women’s Jr. Welterweight Fight between Jessica Camara and Jenna Johlin Thompson, and an amateur bout featuring light heavyweights Joel Tchantchung out of Sugar Ray Leonard Boxing and Keon Burroughs from Washington’s Headbangers gym. Appearances by boxing legends including former Heavyweight Champion Buster Douglas, Ray Mancini, Gerry Cooney and Earnie Shavers; pro athletes including former Washington Redskins Ken Harvey, Gary Clark and Santana Moss; pro boxing champion Ava Knight; Medal of Honor recipient S. Army (retired) Capt. Florent Groberg; “Ballers” actors Omar Miller, Donovan Carter, Kris Lofton and Carl McDowell. Musical performances by E3, a special performance of the National Anthem from Bob McDonald and Caleb Green, and the evening’s headliner, multiplatinum rap performer Flo Rida. The black-tie event will take place at the Washington Hilton at 1919 Connecticut Ave., NW, D.C.